Born on May 29, 1827, in Logan, Virginia, R. Lindsay Walker was a civil engineer and farmer before the outbreak of the war. Physically impressive, Walker stood six foot four. He was a graduate of VMI. He served with the Army of Northern Virginia for the entire war, only missing the Seven Days because he was sick in Richmond. He served in more than sixty engagements without ever being wounded (though he was fond of saying it was not his fault for he was in his share of hot spots!). In the only battle Walker did not command the Light Division's artillery, it was commanded during the Seven Days Battle by Lewis M. Coleman. 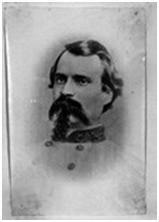 Coleman was killed at Fredericksburg, in the words of R. E. Lee, "while bravely discharging his duty." Walker was promoted to brigadier general in February 1865 after serving the entire war with the Light Division and later as chief of artillery for the Third Corps. He was in command of the detached artillery during the death march to Appomattox. Walker farmed after the war and was involved in railroads and in the construction of the Texas state capitol. He died of Bright's disease (a form of kidney disease) on July 7, 1890, in Fluvanna County, Virginia. Source of information: website, And Then A. P. Hill Came Up, 1997-2010 by Jen Goellnitz.